OK, remember those other hives that I mentioned checking... Well today was the day of all beekeeping days. I checked every hive, with the exception of the new swarm and the split. I took what seemed to be forever, but I did it, I went through every frame and documented each one. Thankfully, the rest of the hives were not in as bad of shape. They were all fairly strong based on stores and brood. The only one that was a bit weaker than the rest was a late season swarm that Dave caught last year. But they were doing fine, I will hit them with some sugar water just to give them a boost. I split two more hives, it was a matter of convenience, not a necessity. They were both very strong hives and had more than enough brood to pull into a split. However, they did not have queen cells even started. They did have a few queen cups, but definitely not in swarm mode. Since I came across the queen of each hive I went ahead and split them. The first one was one of Dave's old hives, without a doubt the strongest. 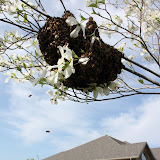 When he sold it to me he indicated it was a hot hive and that he planned to requeen. Although, the seemed fairly agreeable to me. I guess time will tell... I may have just made a clone of the "hot" hive and will now have two. Oh well, we can always requeen them both later. I will put up with a slightly aggressive hive though if they are a good producer and with a super of honey already on top, they look to be just that. I will see how they recover after stealing their queen, but if all goes well this hive may be the mother load! The other hive I split was my overwintered Italians. They weren't quite ready two weeks ago, but they were ready to go today. No queen cells, but lots of brood frames. So, I picked out 4 frames of brood and a frame of honey, left them with some fresh eggs and larvae, then stole their queen. 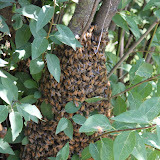 Some beekeepers would consider taking the queen a risky move as the parent hive may abscond with the new virgin queen. This is true, however, removing the queen pretty much guarantees that the original colony won't swarm. No queen - no swarm. So, the benefit can outweigh the risk at times. Hopefully, the virgin will go out get mated and then come back to carry on the bloodline and continue to be a great producer. I am also happy to report that the swarm we caught over the weekend is doing well and all settled in (see the picture above). I pulled out the plastic foundation frames and replaced them with some of those brand new frames that my wife and daughter helped me put together. They will get a feeder in the next few days. But seeing them all settled in and out flying was a great end to a very long tiring day.